When I was growing up I always imagined how cool it would be to make my children’s Halloween costumes. My Mom made some fantastic costumes for me (although the beautifully painted cardboard butterfly wings did not fare so well in the rain). My daughter has given me a number of opportunities to flex my creative muscle, but it wasn’t until last year that my son wanted anything other than an “off the rack” costume. Or perhaps it could be better explained that this Mommy was not up for re-creating a Star Wars character herself when it could be easily purchased. Rewind to last September when I asked my son what he wanted to be for Halloween. He said a Wii Remote. Excuse me? Come again? A what? A Wii Remote. OK…. I thought he was kidding. I thought be might change his mind. Then I suddenly realized this was a Golden Opportunity to actually create a super cool costume for him. I started with making the basic costume out of 2 shipping boxes. I left the flaps opened on the side so he would be able to stick his arms out. I also cut a hole in the front so he would be able to see. I also left the bottom flaps separate so that walking would be easier. I duck taped the heck out of those 2 boxes to keep them together. My daughter was gracious enough to help me model this part of the process. 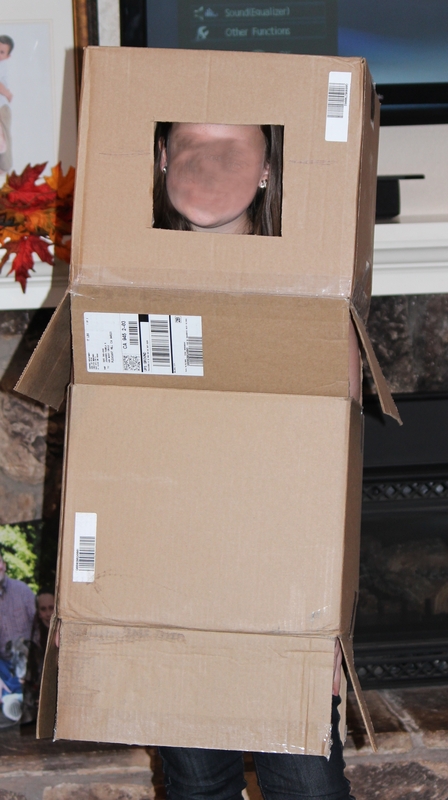 We quickly realized that having a box rest on your head was not going to be a comfortable scenario for Halloween success. I was able to add shoulder straps inside so that the costume rested evenly on my son’s shoulders instead of on top of his head. Sadly, my photo of this great idea is missing and the costume has been passed on to someone else to enjoy. After getting the structure of the costume finalized, it was time to start the design aspect. I covered the entire costume with white contact paper. Then it was time to make the buttons. Wanting to have a something that was raised off the costume, I cut out pieces of white craft foam. The symbols on the various buttons were cut from vinyl. 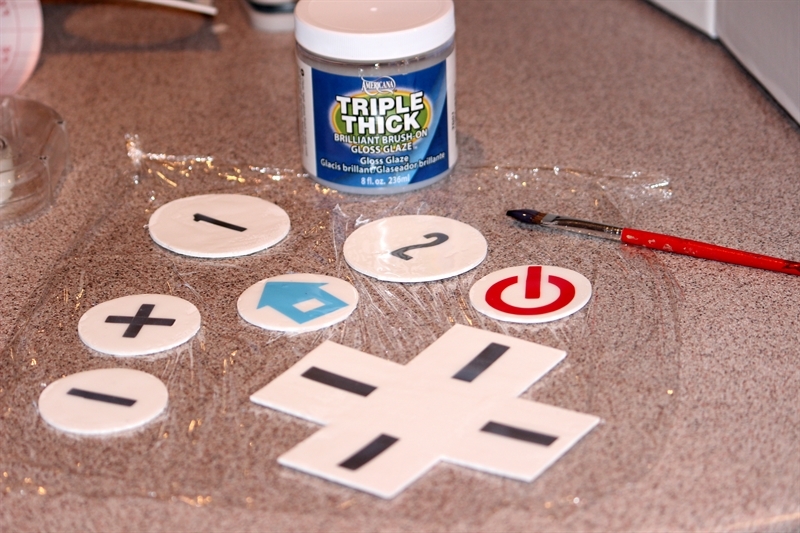 When I could, I enlisted the help of my trusty Cricut to cut the shapes. I attached the vinyl designs to the white foam “buttons”. I then painted over the entire button with Triple Thick Gloss Glaze to give it a glossy, finished look. I then attached the buttons to the costume with super strong Glue Dots. It ended up being a really cool costume. Everyone wanted to know who the Wii Remote was. He was a man of mystery. I think my son liked that he was wearing his own clothing underneath and could take the costume on and off as needed instead of struggling with wearing his costume all the time. As I dropped him off at school I told him, “Don’t let the other kids push your buttons!”. I think he rolled his eyes, but I don’t know because I could not see his face. Categories: Costumes, Creativity, Cricut, Holiday Fun | Tags: Boy Costume, Cricut, DIY Halloween Costume, Nintendo Wii, Tween Boy Costume, vinyl, Wii, Wii Remote, Wii Remote Costume | Permalink. I know they say that, “everyone is Irish on St. Patrick’s Day”, but I am not so sure. I grew up going to Catholic school. Generally, at Catholic schools (especially back in the 70’s and 80’s) there are a lot of Irish and a lot of Italians. I am a quarter Italian and 0% Irish. I often felt fairly out of place not being 50% or 100% one of those 2 nationalities. Today is the day that I am reminded I am 100% NOT Irish. I love the enthusiasm. I tend to be pretty spirited about whatever I am doing, but have found that I just can’t quite pull off much for St. Patrick’s Day. I always wear green and we eat the requisite meal. I am happy my kids are past the leprechaun trap stage as that was a special kind of torture for me. At any rate, I am thrilled to be invited by much-more-Irish-than-me friends to their house for dinner. I was asked to bring dessert, so in the spirit of my Lenten crafting challenge, I had fun with it. I started yesterday and am done by noon today which is huge for me as I am the “Queen of Procrastination”. I did Thin Mint Truffles and Minty Mini Cupcakes. These are the Thin Mint Truffles. Throw a box of Thin Mints in the Cuisinart and combine with a block of cream cheese. Roll balls and dip in chocolate. What is not to like? This is probably a good time to mention that while I am fairly crafty with a lot of things, cake pops (or anything rolled and dipped) are not my strong point. I doubt anyone is going to complain! 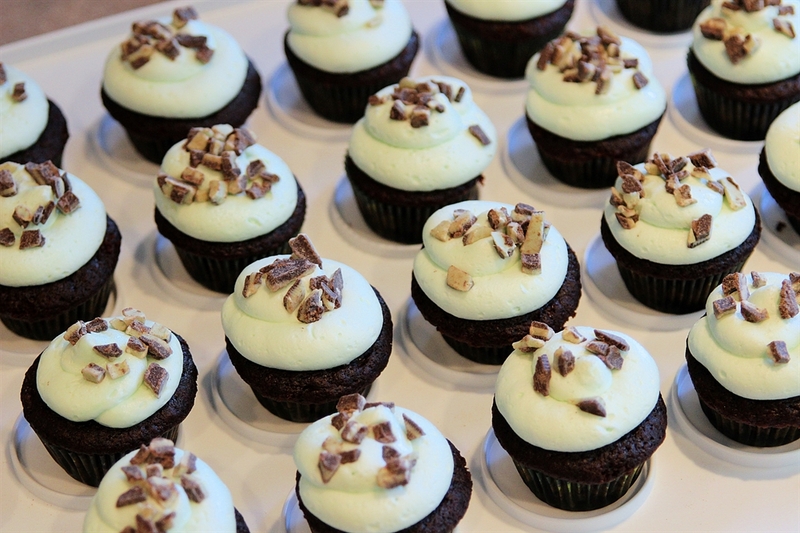 Next up the Minty Mini Cupcakes. Homemade double chocolate mini cupcakes topped with fluffy mint butter cream. 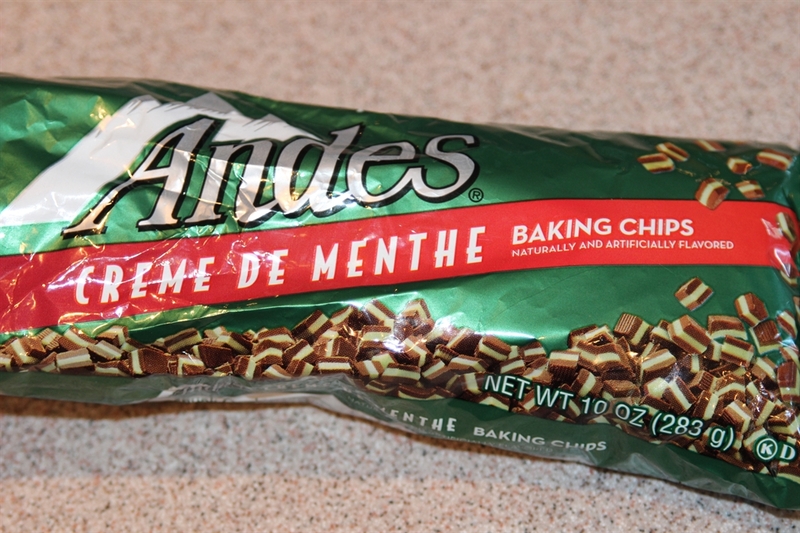 They are topped with pieces of Andes mints which did not come out of the bag quite as pretty as I imagined them. I bought these at Walmart before Christmas and they never ended up in any of my Christmas cookies. I think they will be quite tasty and I look forward to using them again soon. I hope all of you have a wonderful St. Patty’s Day however much Irish you are! 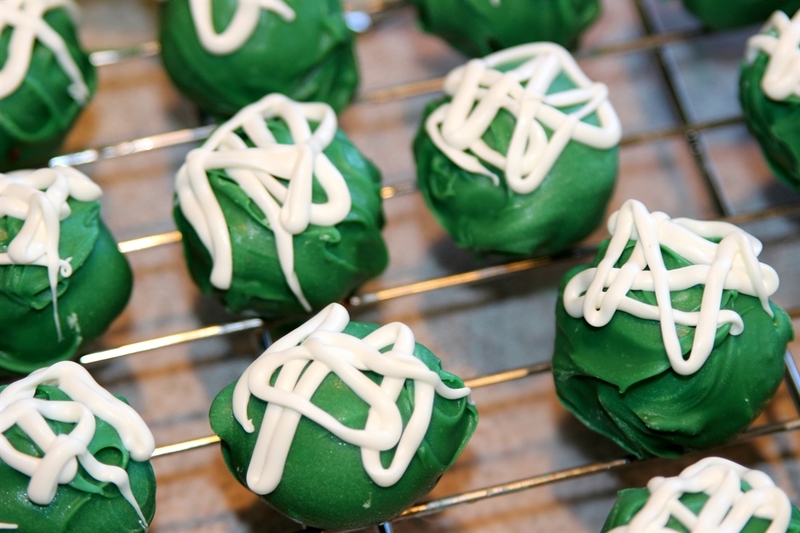 Categories: Cooking, Creativity, Girl Scouts, Holiday Fun | Tags: Andes Mints, Cupcakes, Irish, Minty Mini Cupcakes, St. Patrick's Day, St. Patty's Day, Thin Mint Truffles, Thin MInts | Permalink. 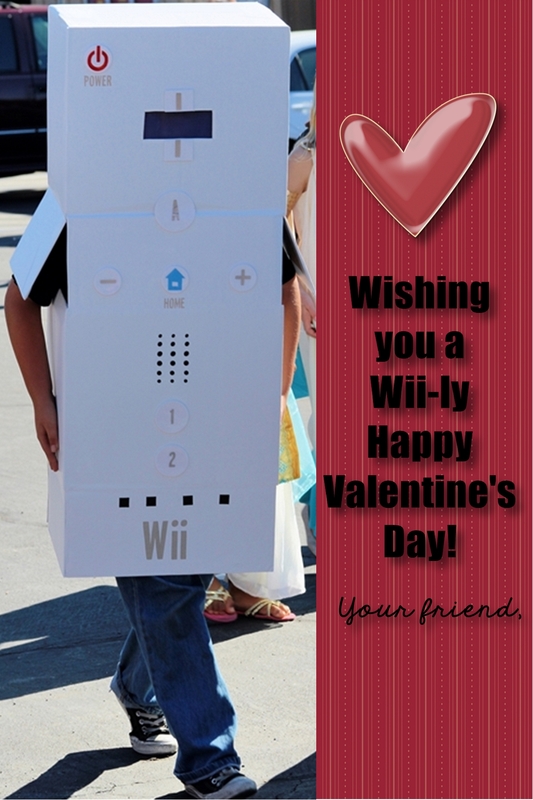 Wishing you a Wii-ly Happy Valentine’s Day! I guess I’m on a roll with the digi scrap program this week. In addition to using it for my Girl Scout Cookie thank you notes, I’ve also used it for my children’s Valentine’s for a number of years. I love that they can have really personal Valentines to hand out to the class. Again, I make them as 4″x6″ cards (or sometimes 3″x5″) which I can print out as pictures. I usually start “bugging” my kids about what they want to be for Halloween sometime in August. I am the “Queen of Last Minute” (no joke, I think the first pin I ever pinned on Pinterest was a sign that said, “Don’t rush me, I’m waiting for the last minute.”), but I do not like being left in the lurch for Halloween costumes. My son has pretty much always opted for something he can buy at the store. That was fine with me because I was not going to attempt to make a homemade Star Wars character anyway. This past year, he told me early on that he wanted to be a Wii Remote. Um, excuse me, you want to be what?!?!?!? I thought he was kidding. I also thought he would change is mind. No such luck, he had decided what he wanted which presented Mommy with the awesome challenge of making his dream come to life. I am happy to say that I met the challenge and he ended up with a really cool costume! I will do a post on the making of this crazy costume later this summer. For now, I hope you have a Wii-ly Happy Valentine’s Day! Categories: Costumes, Digital Scrapbooking, Holiday Fun | Tags: digi scrap, digital scrapbooking, Valentine's Day, Valentines, Wii, Wii Remote Costume | Permalink.